The Iowa State Cyclones hope the home field is an advantage as they play the first of two straight home games this weekend against Oklahoma State. 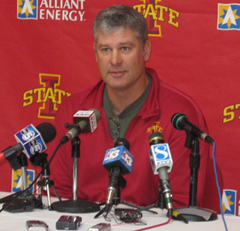 The Cyclones are 5-4 after a loss at Texas A@M.
Cyclone coach Paul Rhoads says they are excited about entering the 4th quarter of the season with two home football games. He says they still have a chance to grow and improve and that’s what they want to do in these last two games. Rhoads believes the Cyclones will be at full strength this weekend, with Alexander Robinson, Austen Arnaud and Reggie Stephens all back for the offense. Center Reggie Stephens missed the Texas A@M game after undergoing an emergency appendectomy last week.